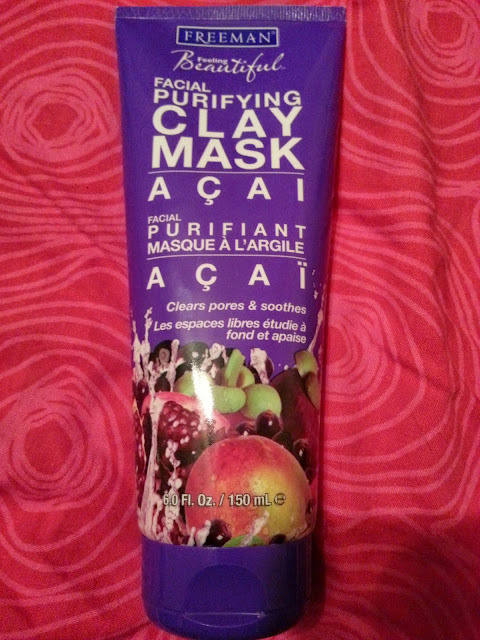 I purchased this Purifying Clay Mask a few weeks ago from Walmart. My Glam Glow sample (from Ipsy) was starting to get really low, and I liked the way my skin felt and looked after using a mask. Since Glam Glow was the first clay mask I had ever tried, I wasn't exactly sure what to look for. I ended up picking this Freeman Beauty - Acai Facial Purifying Clay Mask, because it doesn't sound like it would be too harmful to someone with sensitive skin. The package says it clears pores and soothes. It also was an affordable price, I believe it was $3.99, which is a much better price tag than other brands. The description for this mask says it's "A quick fix for dulling skin, powered by an 8-antioxidant blend of Acai, Blueberry, Cranberry, Goji, Mango, Mangosteen, Noni, and Pomegranate to neutralize environmental damage. Super oil-absorbent clays draw impurities from skin and clean out clogged pores. Perfect for all skin types." This mask is pretty thick, so it took a good squeeze to get it out of the package. I made sure to dampen my face first, so the mask would spread smoothly, and evenly. Also so I could use less product with full coverage. The mask itself is blue. I thought this was interesting since it says its clay, but no biggie. It smells okay, and washes off really easy. The first two weeks, my skin definitely purified itself. I got a few breakouts on my chin, and forehead, and the only thing I could link it to was the purifying of this mask. My skin has calmed down a lot since then, and I enjoy using this mask. In the beginning I was using it about 3-4 times a week, but I have scaled back to only once or twice a week because I think my skin couldn't handle it. I really enjoy this mask, and can't wait to try others from this line! this one is on my list to try, just waiting for one of my local stores to get it in. Thanks for the reveiw!